In just over 20 years, the Archbold Classic Golf Tournament has raised over $1.7 million in support of the Archbold Scholarship Program. Scholarships are awarded to Archbold employees and local deserving students to provide important financial support while they pursue degrees in nursing or other health care related fields. From the beginning, the factor that has made the Archbold Classic unique among golf tournaments has been the recruitment of professional golfers from the PGA, Seniors and Web.com tours to play alongside our amateur players. “Many of the pros who have played in the Archbold Classic have gone on to great PGA careers,” said Don Demsher, tournament director. “These include Bubba Watson, Sonny Skinner, Jason Dufner, Joe Durant, Chris DeMarco, Ben Bates and Kenny Knox, to name a few. All of the pros enjoy coming to Thomasville and travel many miles to raise funds for a good cause,” Demsher added. Contributions by businesses and individuals are what drive the fundraising success of the Archbold Classic. Many of the sponsors have contributed to all past tournaments. Last year's event raised over $250,000, a record we hope to surpass this year with your help. 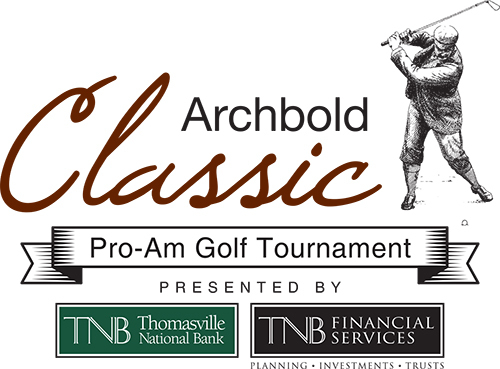 The 24th Annual Archbold Classic was held on Monday, November 5th, 2018. For more information on sponsorship opportunities, please email the Foundation office, or call (229) 228-2924, or sponsor below.